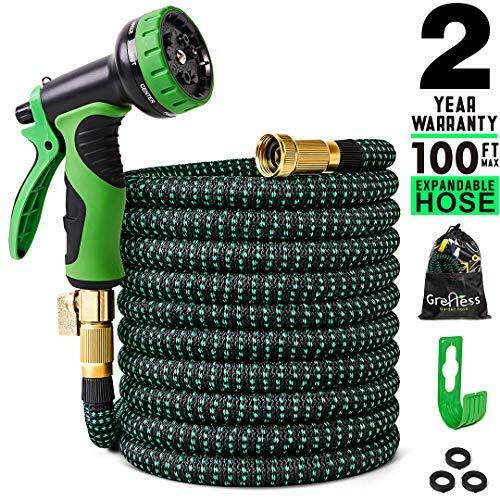 2019 NEWEST UPGRADED EXPANDABLE FLEXIBLE GARDEN HOSE, bid farewell to the traditional heavy Hoses! Our garden hose NEVER KINK!NEVER LEAK!FLEXIBLE and EASY TO HANDLE! MAKE YOUR LIFE EASIER! Be closer to nature. Enjoy pleasure of gardening! Maybe you are looking for a Flexible garden hose for your family or friend. GRENESS IS THE BEST CHOICE! Extremely durable three layers of natural latex core and 3750D tough outer weave that made. The high quality brass fittings will corrosion resistance and no to rust. Newest Upgraded garden hoses are completely leak-proof, have anti-rupture functions. Our water hose equipped with a high-quality free 9-pattern rotating garden hose nozzle, suitable for all of your outdoor watering, you can car washing, cleaning lawn and shower for your cute pets. Our flexible water hose is lightweight to make caddying it around easier. We have also prepared free storage bag and garden hose holder for you. they will help you save space. If you have any problem with our garden hose, please let us know about it.We will refund or exchange your garden hose. Greness will do what ever it takes to ensure your complete satisfaction. CLICK【Add to Cart】get expandable garden hose NOW. And enjoy your gardening life! 【Free Multipurpose Rotating Hose Nozzle with 9 Patterns】This Flexible Water Hose comes equipped with a high-quality 9-pattern rotating Garden Hose nozzle, which is slip-resistant and comfortable to use. Suitable for all of your outdoor watering needs. The Expandable Hose can water your lawn, clean your yard, wash your car and even shower your pets. Garden Hoses make your life easier. 【Perfect Leak-Proof Garden Hose】The solid 3/4 Inch brass connectors and 2 layers of latex piping ensures our Garden Hoses perfectly solve the leak problems of plastic connectors. The Water Hose also comes equipped with brass switch valves, so it's easy for you to shut off the water without turning off the tap, making the Garden Hose easier to use. Our brass connectors are in line with all American standards. 【Durable & lightweight】This Flexible Garden Hose has superior quality brass connectors and shut-off valves, which give excellent corrosion resistance and no rusting. The super strong Water Hose can withstand up to 12 BARS of water pressure and temperatures up to 113°F. It is lightweight, making carrying it around easier, and you can take it anywhere you need. 【2 Years After-Sales Support】Our Garden Hose is high quality, hard wearing and lightweight. We guarantee a replacement for any Garden Hose that has a manufacturing defect within 2 years of purchase and give a 60-day money back guarantee. if you have any problems with our Water Hose, please contact us, we will give a full refund or provide a replacement to you. We will do our best to help you solve any problems. We offer premium quality and the best service. 【Newest Upgraded Garden Hose】This Water Hose is made from the highest quality materials and is of the latest design, to avoid most problems with Garden Hoses. This Flexible Hose is extremely functional, lightweight and flexible, in addition Expandable Flexible Garden Hose will never kink, burst or become tangled. When you turn on the tap, this Garden Hose can expand to up to 3 times its original length.It contracts to the original length when the water is off, making storage simple. If you have any questions about this product by Greness, contact us by completing and submitting the form below. If you are looking for a specif part number, please include it with your message.